An Anatomie of the World, I. 205-18. The Works of John Donne (Wordsworth edition 1994), 177. I conclude therefore that this star [Tycho’s supernova] is not some kind of comet or a fiery meteor, whether these be generated beneath the Moon or above the Moon, but that it is a star shining in the firmament itself—one that has never previously been seen before our time, in any age since the beginning of the world. In De Stella Nova, as translated in Dagobert D. Runes, A Treasury of World Science (1962), 108. Minorities are the stars of the firmament; majorities, the darkness in which they float. 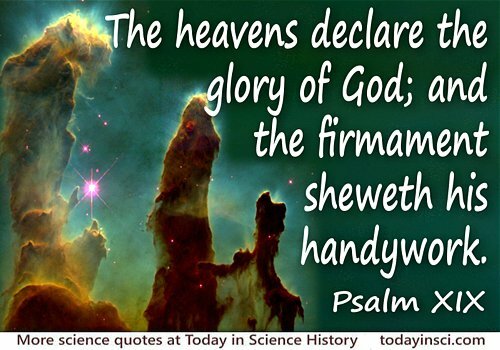 The heavens declare the glory of God; and the firmament sheweth his handy work. … In them hath he set a tabernacle for the sun, which is as a bridegroom coming out of his chamber, and rejoiceth as a strong man to run a race. His going forth is from the end of the heaven, and his circuit unto the ends of it: and there is nothing his from the heat thereof. Psalm 19, verse 1 from the King James Bible (translated 1611), as in The Holy Bible Containing the Old and New Testaments (1709), 347. King Lear (1605-6), I, ii. To set foot on the soil of the asteroids, to lift by hand a rock from the Moon, to observe Mars from a distance of several tens of kilometers, to land on its satellite or even on its surface, what can be more fantastic? From the moment of using rocket devices a new great era will begin in astronomy: the epoch of the more intensive study of the firmament. (1896). As quoted in Firmin Joseph Krieger, Behind the Sputniks: A Survey of Soviet Space Science (1958), 23. We find it hard to picture to ourselves the state of mind of a man of older days who firmly believed that the Earth was the centre of the Universe, and that all the heavenly bodies revolved around it. He could feel beneath his feet the writhings of the damned amid the flames; very likely he had seen with his own eyes and smelt with his own nostrils the sulphurous fumes of Hell escaping from some fissure in the rocks. Looking upwards, he beheld ... the incorruptible firmament, wherein the stars hung like so many lamps. The Garden of Epicurus (1894) translated by Alfred Allinson, in The Works of Anatole France in an English Translation (1920), 11. Is miracle; for there no new things are.